Mobile optimized websites - So that users can impeccably reach your website contents using all sorts of handheld devices. Modern vision - Style is a matter of taste and perception, but still we can distinguish old-fashioned from modern and the web is no exception. Having a modern online appearance signals your customers that your site is up to date and your online service is top-class. Auto classifieds software / Car inventory manager - Of course, we cannot lose focus and ignore the core of every car dealer website. One should be able to easily add new cars on stock, delete old listings and use all the features that the classifieds software has to support - car search functionality, car image gallery, car details set, in-depth description, contact4 info, car compare functionality etc. Social media links - Now that everyone is on Facebook, Twitter and other social networks, it’s a crime not to use these channels to promote your brand and attract new leads. Let them follow you and keep your feeds fresh! SEO optimized websites - In today’s world of information overload and service oversupply, it’s hardly possible to rank on Google’s page one, but if you need a fresh extra traffic from search engines, you need to have a technically optimized website fitted with all necessary tools to make it SEO-friendly even on your own. Smart Content Management System (CMS) - A CMS will not enhance your website as a whole, but it will save you both money and time for making changes on your website, which might be relatively important (like changing your phone number, for example). CMS with a built-in on-site editing feature are the latest hit on the market. Channel management - Buyers surfing online in search of a new car will most probably land on some of the biggest “cars for sale” online platforms. The ability to post your car listings on these popular online hubs through your website’s car inventory manager will save you lots of time to manage multiple accounts and online channels. Of course, there are lots of other things you should consider - like the support service and the ability of your web or creative studio to provide custom modifications to match your unique style, business needs and daily operations. We will take a closer look into these factors, too. So what is the key to having the whole package, both time- and cost-efficiently? 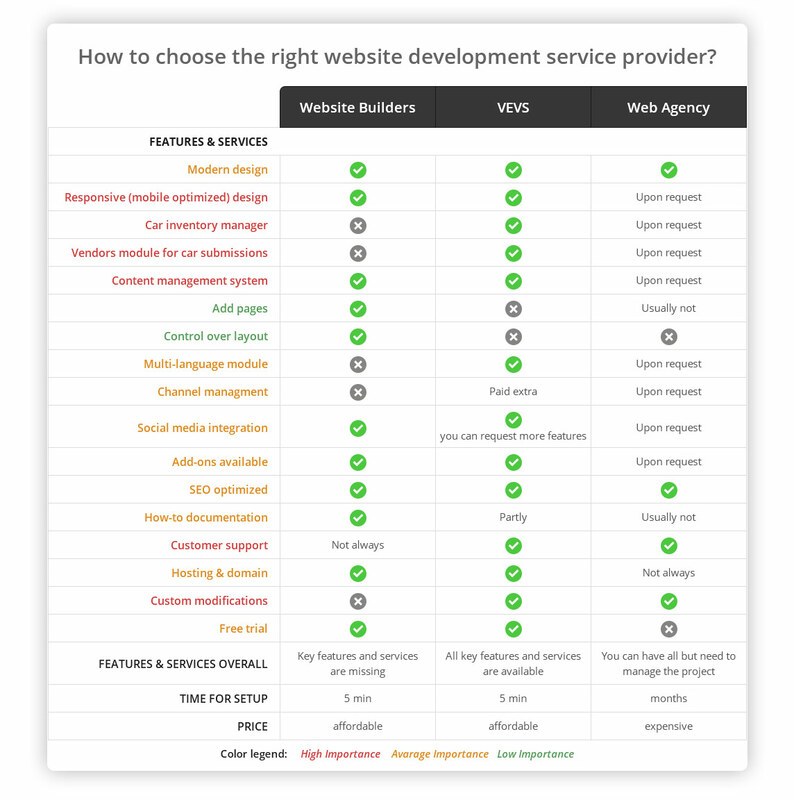 The answer is: choosing the right website development service provider. Using a website builder such as Wix, Weebly, WordPress, GoDaddy, Squarespace, Jimdo etc. 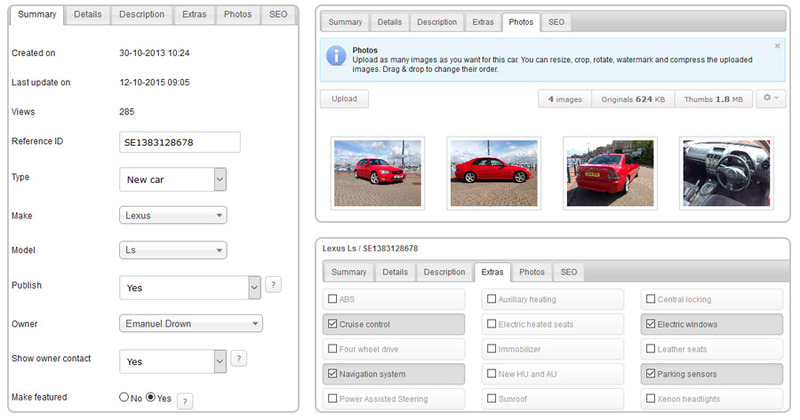 Using VEVS - fully featured, ready-to-use car dealer website solution. Using the services of web design / development agencies. Let’s review the general pros and cons of all three options together, so you can make your best choice. Pros: With most of them you have access to modern website templates in terms of technology and style. You can start your website within minutes and manage colors, fonts, layouts. Their core is the CMS allowing you to edit all website contents. You have a free trial so that you can test before you buy. Furthermore, it’s a relatively affordable solution. Updates are regular and a trusted source for keeping pace with the latest trends. Cons: Website builders do not have a built-in car inventory manager or full-service auto classifieds software. Sometimes you can use other tools provided by the respective web shop to sort this out, but this is a workaround which is hard to manage. Usually, no customizations are available and there is no car channel management feature. Bear in mind: Oftentimes there are only 1 or 2 themes designed especially for car dealerships and if you choose to go with another theme that you like most, then it might take you days to convert it into a car dealer website. Sometimes you do not have access to any support service. Pros: These websites have modern looks and are both mobile- and SEO-optimized. You can launch your website in no time as soon as you upload your contents and adjust all settings. They come standard with car classifieds software, so you can manage your car inventory easily and swiftly. 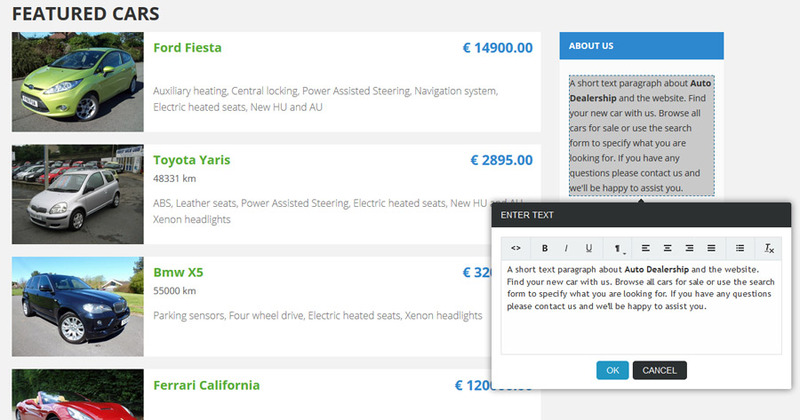 The classifieds software turns on a vendors’ module and converts the website into a car listing platform. You can edit the whole website content through a back-end CMS and enable an on-site editor tool. You have a free one-week trial. The price is nice and certainly pays off. The support service is included in the package. You can also request a multitude of add-ons & extras (mobile app, channel manager, forum, blog etc.) and order any custom modification. Cons: You cannot change your design and layouts on your own (though you can select from 10 available color themes). 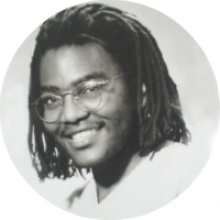 You cannot add / remove website pages and elements - the technical support will do it for you. Bear in mind: You have access to a full set of tools that can enhance your website performance, but some of them are paid. Pros: You can have everything you need: a modern and unique website built just for you. Cons: It is rather expensive. It will take time (usually a few months) before you get your website up and running. You will have to spend a lot of efforts and time in managing and coordinating the project, since the provider will ask you about your exact requirements and specific details. You cannot get a demo in advance. Updates are on demand and for you only, which means additional costs and time yet again. Bear in mind: There is a myriad of agencies out there on the web market, which makes choosing and trusting one of them a hard task, too. First and foremost, ask for their portfolio - they might have built car dealer websites before and might be great web designers as well, but make sure that they can understand your business needs, too. Explicitly define what you need in terms of car inventory functionalities and convince yourself they have a solid experience in web software development. More often than not, agencies do not provide hosting services so you will have to deal with third-party companies to take over the website maintenance. 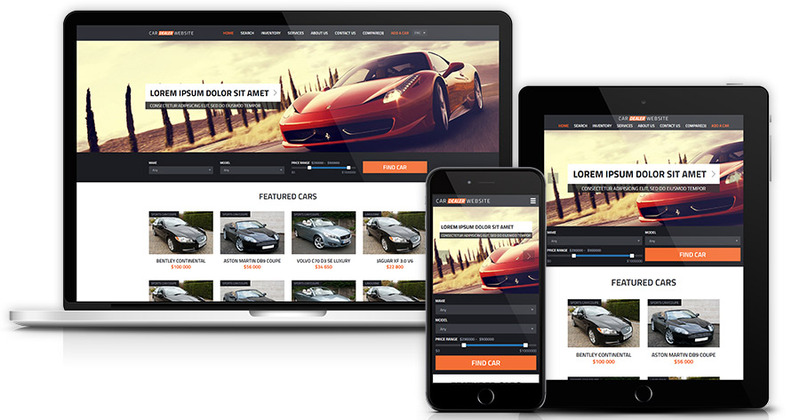 Yes, you can have a modern car dealer website that comes with all standard website features - quickly and at a reasonable price. As evident from the infographic above, VEVS.com tops the other two options, since it’s a good combination of an affordable, ready-made solution like any website builder and a custom solutions provider like any website design agency. You get an all-in-one website solution that can be customized to fit your unique business needs.